The nation's retailers ushered in the post-Christmas shopping season on Tuesday by slashing prices even more on holiday items and stocking up on fresh merchandise. "Everyone is looking for the same thing, and that is a good deal," reports WCBS-AM's Peter Haskell (audio) from the J.C. Penney in Jersey City, N.J., which opened at 6 a.m. Some Jersey City shoppers stopped by on their way to work, says Haskell. With the 2006 pre-Christmas season falling short of sales expectations for many merchants, the retail industry hoped that shoppers, armed with gift cards, would spend freely in the weeks ahead on discounted items as well as full-priced merchandise. That would boost business in December and in the fourth-quarter. Panicked price slashing spurred a last minute shopping frenzy, but it wasn't enough to cross the Christmas finish line on a high, reports CBS News correspondent Bill Whitaker. Spending by the Visa credit card's millions of customers rose 6.5% this Christmas season. Not bad, but last year was much better, up 8.3%. Federated Department Stores Inc.'s Macy's opened its doors at 7 a.m. and offered discounts ranging from 50 percent to 75 percent. Toys "R" Us Inc. offered 50 percent discounts on selected toys. The toy seller was also showcasing hot toys from 2007 in its stores. Merchants "are going to use all 31 days in December," and the month of January, said Marshal Cohen, chief analyst at NPD Group Inc., a market research company in Port Washington, N.Y.
At Buckland Hills Mall in Manchester, Conn, about 10 people waited outside Macy's as the doors opened, including Liz Pistritto and her daughter, Nina Gioielli, 24, who go to Macy's every year for the post-Christmas sales. "It's a tradition. We've been doing this since I was little, since I was 2 — and I'm 46 now," said Pistritto, who said they spend three to four hours shopping on the day after Christmas, mostly looking for ornaments and wrapping paper. At Buckland Hills' Bath & Body Works store, Maria Ness of Galstonbury, Conn., was loading up on hand lotions and other items for herself. "I've been waiting for the sale," Ness said. Meanwhile, at Carousel Mall in Syracuse, N.Y., there were more mall walkers than shoppers when J.C. Penney opened its doors at 6 a.m. Pat Dunn of Syracuse, who was browsing around the housewares section looking for sale items, said her trek was an annual affair. And, she said, she wasn't about to let the cold rain falling outside deter her. "Everything is so marked up. This is the best time to shop," Dunn said. "This is for next year." Dunn said she received gift cards for Christmas but wasn't using them now. "I'll use them later for something for myself," she said. After a stronger-than-expected turnout on Black Friday, the day after Thanksgiving, stores struggled through the first two weeks of December as consumers returned to malls and stores at a disappointing paced. Stores did get a late-buying sales surge in the final days of the pre-Christmas season, but it was not enough to meet holiday sales goals. "I think what we'll have is some retailers ending up walking around whistling ho, ho, ho. Others are going to find a lump of coal in their Christmas stocking this year," said Al Frank of Deloitte & Touche. That's typical of retailing these days, says Leibmann. Discount stores struggled more than luxury retailers. "A lot of people were struggling to make ends meet, especially people who were shopping at the Wal-Marts and Targets of this world," she said. "A few people have lots of money to spend so they're at Nordstrom, Neiman Marcus, but most of the country continues to struggle and you saw that in retail sales." "If you had the cash, you heard the ka-ching," reports CBS News correspondent Bill Whitaker. "It started out a little bit slow," admitted Rick Caruso of The Grove, one of Los Angeles' toniest shopping spots, "but the last two weeks have been very strong. The last week has been exceptional." Leibmann says there were two factors at work in this year's Christmas retailing: The calendar and the weather. "The calendar tells us how many days before Christmas. This year we had an extra day and it was a weekend, so people could wait. They waited until they had the day off, maybe Friday, jumped into the stores Friday afternoon, Sunday," Leibmann told Early Show co-anchor Tracy Smith. The other factor, says Leibmann, was the weather. "East of the Mississippi it was warm, which made it very difficult to sell a coat or a sweater or gloves or anything like that," she said. Based on data released late Sunday by ShopperTrak RCT Corp., sales for both Friday and Saturday generated a combined $16.2 billion, with Saturday's business totaling $8.72 billion. But Bill Martin, co-founder of ShopperTrak, said he had expected the finale to be stronger; because it wasn't, stores need a good post-Christmas season to meet ShopperTrak's 5 percent holiday forecast. Amazon.com reported Tuesday that the season finished as its "best ever," with the busiest day being Dec. 11. Among the best-selling items were Apple's MacBook 13.3 inch Notebook PC and books like "On a Diet: The Owner's Manual for Waist Management" by Mehmet C. Oz and Michael F. Roizen. Yahoo! 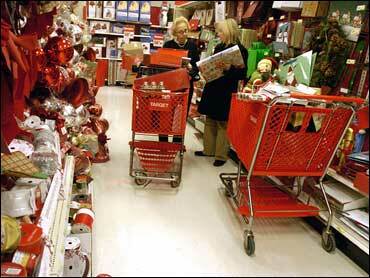 Shopping reported Tuesday that its holiday season beat internal forecasts. It said that the number of shoppers to the site rose 24 percent in December compared to the year-earlier period. Traffic to merchants rose 30 percent in the past month, compared to the year-earlier period. The post-Christmas season has become more important with the increasing popularity of gift cards. Gift card sales are only recorded on retailers' balance sheet when cards are redeemed. According to BigResearch, which conducted a poll for the National Retail Federation, consumers are expected to spend a total of $24.81 billion on gift cards this holiday season, up from $18.48 billion last year. In 2005, the week ended Saturday Dec. 31 accounted for 15.6 percent of holiday sales, compared with 10.3 percent in the corresponding period in 2004. A poll of 1,200 shoppers conducted by Kurt Salmon Associates from Nov. 30 to Dec. 5 found that half of respondents said they plan to take advantage of the post-holiday sales. "I think it's going to be a struggle in the week ahead," said Leibmann. "If it holds at what it is, people will be accepting of it. But it's not been a great season as some people would have hoped, I'm afraid."